High Peaks Pure Earth has translated two songs about Tibetan unity. “Mentally Return” was first performed in Rebkong in July 2006* for a large-scale outdoor performance by the giant of Tibetan music today, Yadong, and his three most well-known students, Kunga, Tsewang and Gangshung. “The Sound of Unity” is new from July 2010 and it is performed by the Amdo singer Sherten, also a big name in contemporary Tibetan music. Both songs share the same topic of unity amongst Tibetans but are markedly different in style. Whilst these two songs indicate that Tibetan identity and unity amongst all Tibetans were themes in songs both before and after the turbulent year for Tibetans with the protests of 2008, “Mentally Return” is the more cautious of the two songs in terms of the way the messages of the song are conveyed and the lyrics are arguably even more powerful and poetic in their subtlety. 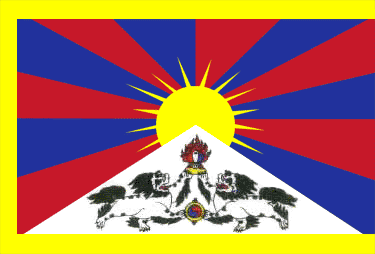 For example, in “Mentally Return”, the word “Tibet” (in Tibetan, bod) is never mentioned and instead, Tibet is referred to as the “bountiful land on the roof of the world” or the “Land of Snows”. The metaphor of the Tibetan circle dance is used to indicate unity and Tibet is also called both the fatherland and the mother – a place of comfort with the feeling of home. Tellingly, the singers are also from various parts of this “bountiful land”, Yadong, Kunga and Tsewang are from Kham and Gangshuk is from Amdo. Their places of origin in themselves are at odds with the map – none of them are from the place marked today as “Tibet” (Xizang in Chinese, known by Tibetans as U-Tsang, central Tibet). On the other hand, Sherten’s 2010 song “The Sound of Unity” directly addresses “Tibetans” and boldly uses politically loaded phrases and words such as “three provinces”, “nation” and “freedom” – all studiously avoided by “Mentally Return” but implied nonetheless. Whereas “Mentally Return” inferred a unity that was related to an inner geography, “The Sound of Unity” literally calls on Tibetans traditionally of all three provinces Amdo, Kham and U-Tsang to unite and to draw strength from each other. The turbulent events of 2008 have clearly made a direct impact on the cultural production of Tibetans and in particular with Tibetan artists and singers. One example is the CD “Torture Without Trace” by another Amdo singer Tashi Dhondup” that High Peaks Pure Earth featured in March 2010 and for which he received a 15 month re-education through labour prison sentence. There is much more that can be said about these two songs and High Peaks Pure Earth invites readers to contribute thoughts and analysis. We also apologise for the poor picture quality of Sherten’s music video. If any reader knows of a better quality video online, please let us know. Mentally Return from HPeaks on Vimeo. Are these are our fatherland, the Land of Snows! “The Sound of Unity” By Sherten from HPeaks on Vimeo. I follow your blog with much interest and appreciate the work you do by selecting and translating important texts from Tibet and China and pointing out significant developments. Kadrin ch�! I wrote a comment about the �Two Songs About Tibetan Unity� you have kindly translated for us, and added some information from my perspective. I took the liberty to publish it on my blog as it wouldn�t fit here. Suffice to say that songs bringing about a sense of identity among the �rugged-faced� folks seem to abound. Ain't that great? My best wishes of freedom for the people of the mountains of snow. Air of purity for so than misery and neglect! A culture can not live if it weakens … is to re-build and never the same again.